I know some may argue that this post should be made in the SMP section only. However, in my opinion, there is going to be so much of overlap between the various treatment modalities (hair transplants, tricopigmentation, BHT etc), that I feel this section is better qualified for such a post. I have been against the concept of permanent tattoing of the scalp having seen many scalps that had it done. Even with the concept of putting the pigment as small dots to simulate hair, the fact remains that it would stay for life and possibly change color (usually turning bluish). Not everyone wants/can sport a shaven look for the rest of one’s lifetime. In May 2014, I got to meet many such patients at different stages (6 months after, 1 year after, 18 months after) when I went to Milena Lardi’s centre in Italy. 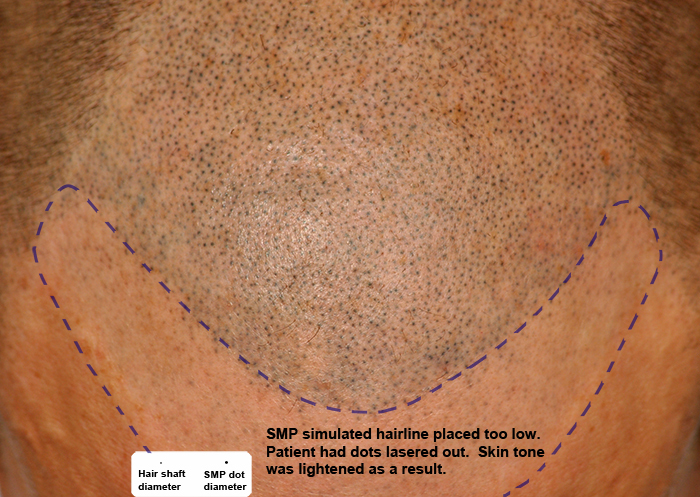 At the outset, I think the term SMP can be misleading for many potential patients as it does not tell whether the treatment is permanent or temporary nor what techniques and type of pigments will be used. (Its like telling the patient he will get hair transplant but not whether it will be fue or strip or plugs). Please feel free to add any more categories or suggestions to modify the classification. The following is a picture of a patient who had got Tricopigmentation done by Beauty Medical , Italy, 1 year ago. Now he has come for a repeat session. Here I can see that the pigment has disappeared except for very few dots (being pointed in the picture by the cotton bud). The dark dots you see towards the bottom right side of picture is the new session being carried out. Dr A, thank you for posting, very interesting to see the scalp after the ink has faded. Dr. Arvind, thanks for a very informative post. What is the difference between Milena Lardi’s technique and the rest? I was under the impression that all the techniques are more or less the same as they are basically tattoos. His head looks quite scarred to me. I wonder if some of that damage is from the procedure or not ? This is the first time I see a pic of the scalp after the ink has disappeared, pretty cool, as if he has never had anything done before. There are lots of differences in various techniques (that is why the classification). However, some part of that information about differences is the intellectual property of Milena Lardi/beauty medical. So, I will request them to directly post on this thread. The fineness of the work, etc. There were no visible scars. 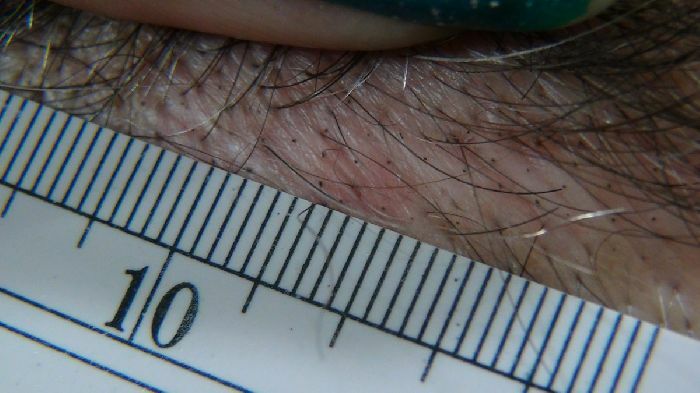 This is an extreme closeup and the nature of the patients skin (skin pores). It looks the same where previously pigment had been put and where it was not. I examined it very closely. I agree, very pristine when the ink is all gone, no signs of having any work done. The downside to ink disappearing is, if you liked the original result, you have to have it done all over again. It’s not cheap. I have personally seen a few patients in person, who had SMP work. The dots were too large and the color had a bluish tint. In my opinion SMP still has a ways to go. The tattoo artist’s aesthetic skill plays a huge role in the naturalness of an SMP result. I continually see unrealistic hairlines and color mismatches. This picture posted below shows how various methods are different. Bluish large dots can not simulate the really tiny dots that simulate a shaven hair. The following picture is of Tricopigmentation (TP 1) done by us in the strip scar of a patient using Milena Lardi’s methods and equipment. Perhaps 3d printers will come to the rescue at some point down the road. If I have the permanent tattoo treatment, can I still do hair transplant later on if I get sick of tattoo and want real growing hair? Thank you. How interesting, same with FUE, needle size matters when it comes to SMP. Yes, it is possible and we do come across patients opting for this. But its not just a matter of permanent or temporary. The technique and equipment leading to the fineness of the pigmentation is something people need to research before taking this step. Its not just the size of the dot. Color - the color in the picture by CITNEWS has turned bluish. Pigment diffusion - there is a diffusion of pigment in the skin between dots in picture posted by CITNEWS v/s the one posted by me. These are also important factors to keep in mind. [quote]Its not just the size of the dot. Dr. Arvind, are you saying some ink turns bluish and some don’t? I thought they all do unless you use permanent ink.